Sacerdotus: Why Won't God Heal Amputees? I received the above tweet today and will write briefly on the site's content. Atheists often ask the question "Why doesn't God heal amputees?" The question is a valid one and is one I asked myself as an atheist. We all hear of miracles and healing. These can possibly be attributed to spontaneous regeneration or remission. What of amputees? Nothing would be so dramatic than to see someone missing a limp appear with one after prayer. Prayer is not a wish granting system. Just because I pray for a new car does not mean I will get it. God answers prayers in accordance to what His will is, if it is right for us and if the time is right. If God answered everyone's prayer in the way they want, it would be a mess. If everyone prayed to be rich, economies would fall apart. If everyone prayed to be the best athlete then there will be no competition and the sports of the world will become boring. If those who prayed for the death of an enemy, many people would collapse all around us. A scene in the movie "Bruce Almighty" highlights this. In the movie, "God" played by Morgan Freeman gives "God power" to "Bruce" played by Jim Carey. Jim Carey begins to answer every prayer without even looking at the requests. The consequence is universal disorder. Prayer is the raising of oneself to God. It is not a wishing well. The link in the tweet attempts to present the amputee question in a way that will stump theists. The site lists specific reasons presenting why God won't heal amputees and then supplies Scripture passages that seem to contradict the reasons. I don't have the space here to go through each reason and reply to them, but from what I read, the author of the website does not understand prayer and is misinterpreting the passages provided. To answer the question, "Why Won't God Heal Amputees?" He does! St. Augustine of Hippo prayed over the leg of an official who had gangrene. Immediately, the leg was cured and the part that was amputated was restored. 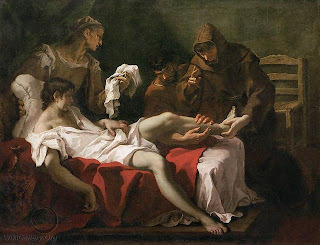 St. Anthony of Padua healed a man whose foot was amputated. A farmer - whose leg was amputated by an accident - named Miguel Juan Pellicier in Spain was healed 3 years later after rubbing chrism on the leg and then having a dream . St. Attalus healed a man who lost his thumb by using saliva. These are some examples. Many more are documented by the Congregation for the Causes of the Saints. These kinds of miracles do happen. Just wondering if you have any more modern examples that have been investigated properly? Augustine and Anthony as well as being from so long ago it's hard to verify if anything at all actually happened sound like anecdotes anyway. The man cut his thumb, not right off and St Columban used his saliva to wipe the blood away. The Congregation for the Causes of the Saints can provide you with more cases of miracles of all kinds. The cases I cited are verified and well documented. They are valid despite the pass of time. Please do show the evidence of these "well documented" miracles. One has to wonder, why there are no solid, scientific proof of these so called miracles? Forget about it, why no proof of god(s)? Which makes your god the right one out of thousand (more or less) out there?